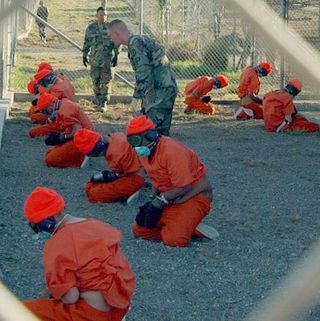 In 2008 the American Psychological Association issued a resolution saying that psychologists may not work in places where people are tortured, or support torture in any form. To many of us have done it anyway. Vincent Iacopino and Stephen Xenakis reviewed Guantanamo Bay (GTMO) medical records and case files of nine prisoners. The records showed that the detainees did tell GTMO medical staff that they were being tortured, tortured with abusive interrogation methods that are clearly defined by the UN as being torture. What they went through was even beyond the Bush administration lax definition of torture. Despite witnessing the physical and psychological wounds of these nine detainees, medical staff took no action to report the violations. They patched them up and sent them back in. Psychologists aren’t alone in failing the very humanity they study, of course: medical doctors are equally culpable … as is the system and officials that put them in this position. But we can’t blame others. We must, as professionals and human beings, take responsibility for our own actions. Science was used as way to perpetuate violence towards others as a way to serve the group with the greatest power. In all cases it took the actions and advocacy of physicians, psychiatrists, and psychologists to demand the recognition that of medically licensed torture and to establish policies that bar participation in torture. They questioned the actions and ethics of those in power all for the well-being of humanity. There’s a quote by Carl Jung on the act of torture, “The healthy man does not torture others – generally it is the tortured who turn into torturers” It may be that the words healthy man should be changed to healthy society. A healthy society does not condone torture, nor should it ask healers to violate their ethics in order to do so.